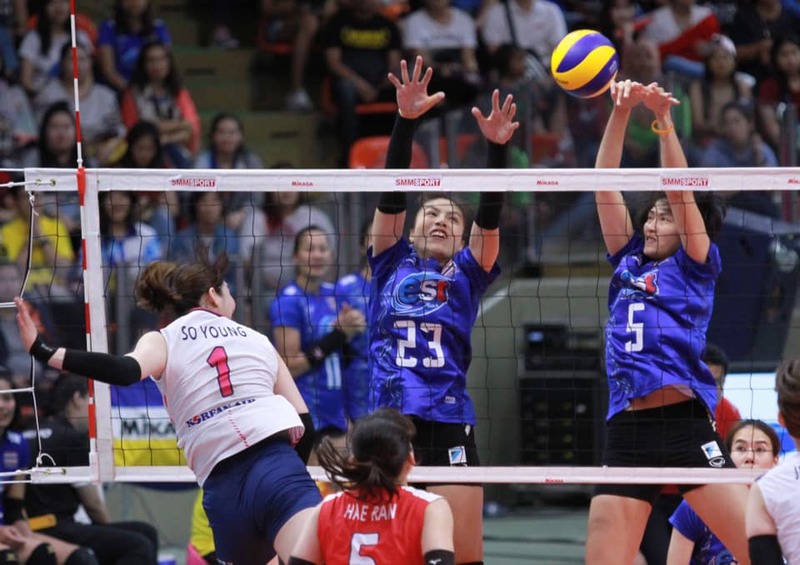 Bangkok, Thailand, April 7, 2019 – After disappointing loss at their Friday’s game of the Korea-Thailand Pro Volleyball All-Star Super Match 2019 Presented by Mitsubishi Xpander, the in-form visitors salvaged the lost pride following a brilliant 3-0 (25-15 25-21 25-23) victory over hosts Thailand in their 80-minute second game at the Indoor Stadium Hua Mark on Sunday. 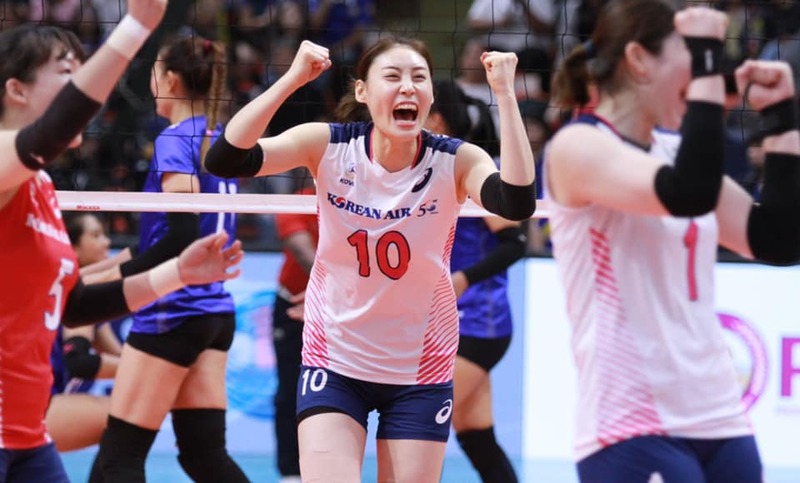 Lee Soyoung finished with a game-high 9 points including 8 spikes as the Koreans made the perfect start to the second match of this volleyball exhibition game, collecting maximum points in front of a thoroughly entertained crowd at the packed competition venue. Ajcharaporn Kongyot led Thailand with 12 points, all from her exceptional attacks. Going down 2-3 to the host side in the first game on Friday, Korea fielded a strong line-up in the opening set led by ace spiker Lee Jaeyeong, Kim Suji and Lee Soyoung. Kim Heejin, Park Jeongah and Lee Dayeong were also called in by coach Park Mihee to strengthen the team. Thailand remained in the same formation with a mixture between three young guns, Thatdao Nekjang, Wanitchaya Luangtonglang and Ajcharaporn Kongyot, and three veterans, Amporn Hyapha, Nootsara Tomkom and Malika Kanthong. It was a tense encounter from the first serve as Korea started strongly, with Park Jeongah and Lee Jaeyeong dangerous from spike range to help their team take a commanding 14-11 lead in the first set. Left-hander Moon Jungwon stretched the Korea’s lead to 19-11, thanks to her incredibly accurate servings which scored five points in a row. The host team tried to put their acts together, but their efforts were to no avail. 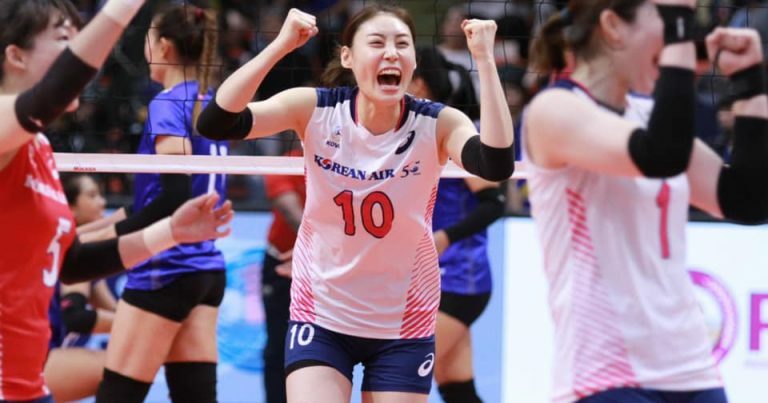 Korea sealed the first-set deal in rapid time as Kim Suji produced an effective drop to put the team in front 24-15 and Park Jeongah landed a thundering spike to end the hosts’ challenge. 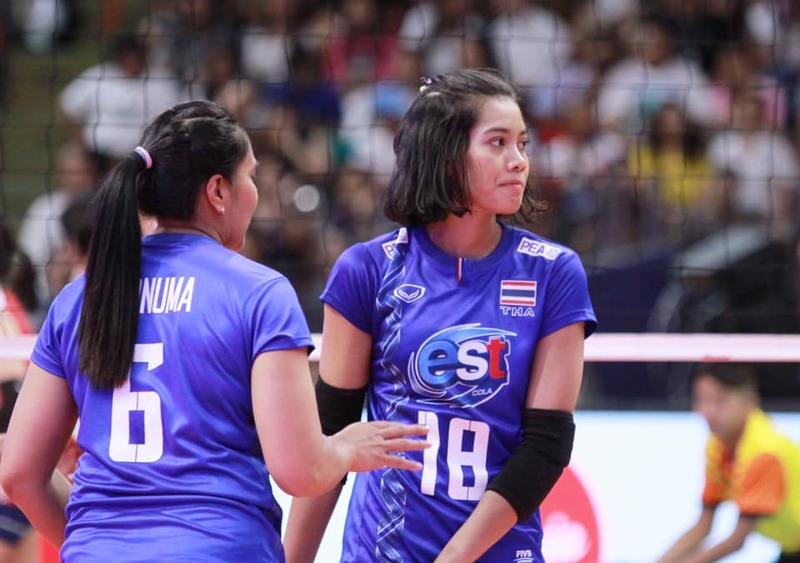 With a one-set deficit, Thailand head coach Danai Sriwatcharamethakul sent in an offensive line-up spearheaded by Pleumjit Thinkaow, Wilavan Apinyapong and Onuma Sittirak with an hope of making a strong comeback in the second set. Both sides fought hard, with Ajcharaporn spearheading her majority of Thailand’s attacks and Koreans Park Jeongah and Lee Jaeyeong on fire throughout the game. 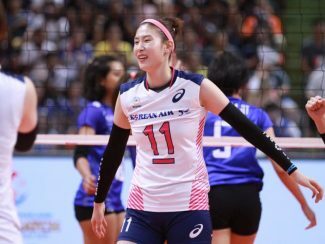 Leading 18-14, Korea cruised comfortably through the set win as Jeongah and Jaeyeong continued to marshal the defence, while Thailand’s communication began to break down. Korea got the job done effortlessly whilst showing flashes of the brilliance that took them past the Thai rivals for the eventual 25-21 win in the second set. The momentum was with the Koreans in the third set and they continued to put the host side under enormous pressure after a well-earned 20-17 lead. However, the visitors’ delight did not last long as Jutarat Montripila and Thatdao Nuekjang were defending brilliantly at the net, blocking almost everything the rivals could throw at them. The score was tied at 23-23, but shortly after that Thailand, forced to play catch-up yet again, failed to really get out of second gear. Korea scored two consecutive points to capture the hard-fought set 25-23 and match. With the convincing win, Korea, currently ranked No.9 in the world, has improved their win/loss record against Thailand to 2-2. 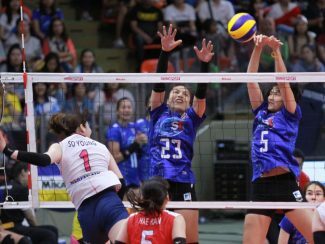 The Korea-Thailand Pro Volleyball All-Star Super Match was first played in 2017 at Indoor Stadium Hua Mark in Bangkok, which saw Korea narrowly beat hosts Thailand 3-2. The visiting Thai squad avenged the loss in the same fashion following a dramatic 3-2 win against the host side in the second edition at Hwaseong the following year. 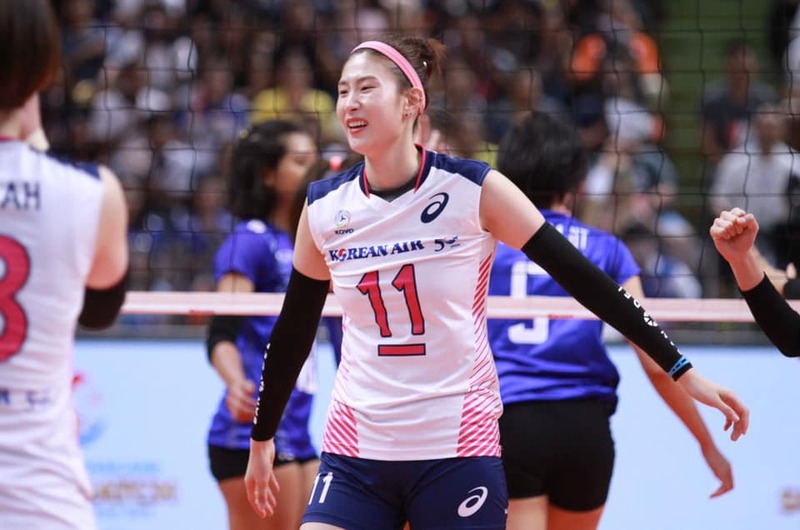 Hosts Thailand held a 2-1 advantage after a hard-fought five-set win against Korea on the Friday’s game at Terminal 21 Korat in Nakhon Ratchasima before Korea restored their pride by winning the Sunday’s game in straight sets for the 2-2 record. Lee Soyoung emerged as the Korean player who won the MVP award, while Nootsara Tomkom won the same award for Thailand. Both teams received plaques from Mr Somporn Changbangyang, President of Thailand Volleyball Association, as well as bouquets of flowers and mascot dolls. Both sides have a very busy competition schedule this year and are due to face each other in many tournaments including the Pool 7 VNL third week in Macao, the Asian Senior Women’s Championship in Korea and likely the Tokyo 2020 Olympic Qualification Tournament.